New Year, New Travels: Fly to Asia for $550! If one of your New Year’s resolutions is to travel more in 2018, then this Singapore Airlines sale will help you accomplish that. From now until January 18, 2018, you can buy round-trip tickets from the United States to Asia for as low as $550. Singapore Airlines is putting both Economy and Premium Economy Class on sale. These are round-trip prices and are inclusive of all taxes and fees. And if you book your tickets during this sale, check-in baggage, carry-on luggage and advanced seat assignments will still be included in the price of your fare. No extra fees! Singapore Airlines Economy Class will offer you an industry leading seat with 19 inches of width and 32 inches of pitch, a personal in-flight entertainment system with on-demand movies, TV shows, music and video games, USB/electrical outlets at every seat and complimentary alcoholic beverages. I recently flew Singapore Airline Economy Class from Los Angeles to Bali and thoroughly enjoyed my flights. You can read my full Economy Class review here. Here are some sample prices. Want to upgrade your travel experience to Premium Economy? Hong Kong can be found for $1185 and other destinations such as Frankfurt, Seoul and Tokyo can be found for $1318. These fares are great for Premium Economy when normal Economy Class tickets on other airlines can cost almost the same price. Singapore Airlines Premium Economy Class will provide you with a more spacious seat in a smaller and more private cabin. Premium Economy seats offer 19.5 inches of width, 38 inches of pitch and 8 inches of recline. All Premium Economy Class seats are equipped with 13.3 inch personal entertainment systems, USB and universal electrical outlets, and foot and leg rests. Singapore Airlines Premium Economy Class passengers also get priority services and amenities such as priority check-in, boarding and baggage handling, “Book the Cook” meals, noise-cancelling headphones and an amenity kit. I recently flew Singapore Airlines Premium Economy Class from Singapore to Los Angeles and really enjoyed my experience. You can review my review here. Book from now until January 18, 2018 (end of day, local time). Travel period for Tokyo, Seoul, Hong Kong and Frankfurt is from May 1, 2018 – May 31, 2018 and August 20, 2018 – December 14, 2018. Travel period for Bali, Bangkok, Jakarta, Singapore and Yangoon is from February 1, 2018 – May 31, 2018 and August 20, 2018 – December 14, 2018. The sale price listed is per person and includes all taxes, fees and other carrier imposed surcharges. There is no minimum stay required but the maximum stay is one month. Promotional Economy Class tickets book into V fare class. With Singapore Airlines KrisFlyer, V fare class tickets will earn 10% mileage. With United Airlines MileagePlus, Turkish Airlines Miles and Smiles, Lufthansa Miles and More, V fare class tickets will earn zero miles. V fare class tickets are not upgradable with miles. Premium Economy Class tickets book into P fare class. With Singapore Airlines KrisFlyer, P fare class tickets will earn 110% mileage. With United Airlines MileagePlus, Turkish Airlines Miles and Smiles and Alaska Airlines Mileage Plan, P fare class tickets will earn 100% mileage. P fare class tickets are upgradable to Business Class with miles. If you have a bunch of KrisFlyer miles or Citi Thank You points and don’t know what to do with them, using them to upgrade from Premium Economy Class to Business Class with this sale can be a good deal. I recently took advantage of a similar deal and booked a Premium Economy ticket from Los Angeles to Phuket with my friends. Using 45,000 KrisFlyer miles, I upgraded my outbound flights from Los Angeles to Phuket (LAX-ICN-SIN-HKT) from Premium Economy to Business Class. 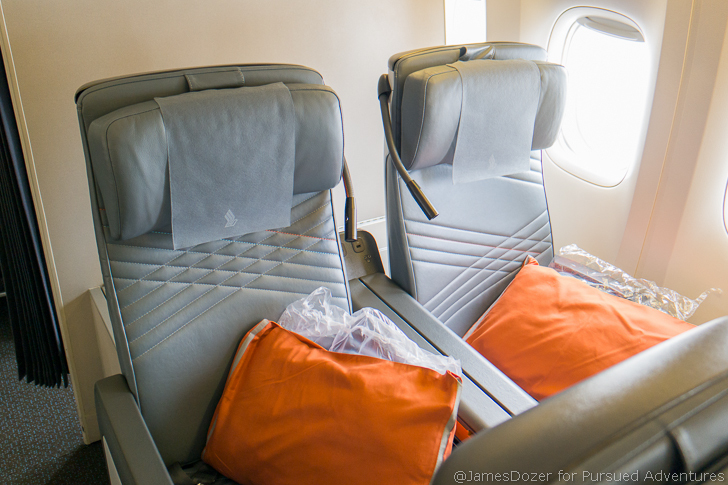 You can read my review of Singapore Airlines Business Class here. And the best part, upgrading to Business Class will not incur any additional taxes and fees. If you have some Citi Thank You points, this is not a bad way to spend them. Singapore Airlines’ upgrade award chart can be found here. Upgrading your ticket is simple and can be done all online. Once you have purchased your ticket, log into your Singapore Airlines KrisFlyer account to manage your reservation. Go to your booking and there will be a link to upgrade your flight using miles. The system will show you available flights to upgrade or wait-list if there are no available seats. Quick tip: if you are planning on using miles to upgrade, search for Business Class award space prior to booking your Premium Economy ticket. These are great prices for travel but unfortunately, are horrible for mileage earning if booked in Economy Class. Premium Economy fares will earn exponentially more miles and will be a much better flying experience but will also cost you about double the price. Overall, these prices are great but will only benefit a small group of people. These deals are only good for passengers departing from one of their United States gateways including Los Angeles, San Francisco, Houston and New York and most destinations will require at least two stops, making for a very long travel day. Additionally, these prices are for travel on Singapore Airlines and SilkAir only. They do not include travel on other partner airlines such as United Airlines. More information about this sale including terms and conditions can be found here. What do you guys think? Will you take advantage of this deal? Let me know in the comments section below. Thanks for reading! Singapore Airlines Sale: Fly to Asia for Just $499!